Multi-threading gives a program the ability to perform several tasks concurrently. This allows the program to perform lengthy operations in separate threads, enabling the user to continue to interact with the program while these operations take place. MT-NewsWatcher uses Apple's Thread Manager to perform multiple tasks simultaneously, so that you can get article headers in one window while reading messages from another group at the same time. 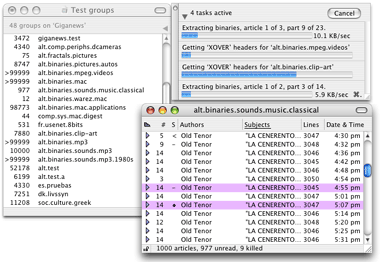 In this image, MT-NewsWatcher is executing four tasks at the same time: extracting binaries for a group, fetching headers for another, mailing a message, and fetching an article. To cancel a task, you can click to select it, then click on the "Cancel" button. You can cancel a task with the keyboard by typing Command-period; the task that gets cancelled is the one marked with the Command-period symbol (e.g. the lower task in the image). When fetching articles for a subject window, or fetching the next article when you already have an article window in front, you can also use Command-period to cancel fetching the article. The articles to be extracted are marked with a diamond character, which changes to the check mark when extraction is complete. 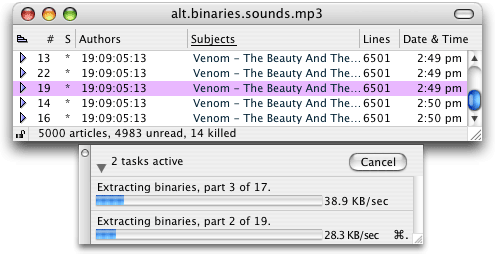 The progress bar shows the status of the complete download operation. If the operation is cancelled, those articles which were marked with a diamond are marked again as unread. Having started one extraction thread like this, you can deselect the previous set of articles, select another bunch and do Command-B again to spawn another thread. MT-NewsWatcher imposes an upper limit of 20 threads, and 6 network connections. To understand how thread and connections interact, you should read this section. The 20-thread limit determines the number of threads that are pre-allocated when MT-NewsWatcher starts up; this translates into an upper limit of 20 concurrent operations (each of which normally shows a status window). If you already have 20 operations going and attempt to start another one (by opening another group, for example) you will get an error message saying that no free threads are available. This limit of 20 threads can be adjusted by editing the 'ThrD' resource with ResEdit, though increasing it will increase the amount of memory used. You can control the maximum number of connections to a news server that MT-NewsWatcher will open in the 'News Servers' dialog. This cannot be increased above 6. Normally, you set this at 4, to avoid placing undue load on your news server. If your server imposes an upper limit on the number of connections, then set this value to that upper limit, which ensures that MT-Newswatcher will never attempt to open more than this number of connections. Every time you perform an operation that spawns a new thread, the program checks to see if you are below the limit on the number of connections. If so, a new connection is opened (or an idle one is reused), and the thread proceeds. If you already have the maximum number of connections active, the thread simply waits until there is a connection spare before it proceeds. Thus, if you open 20 groups at the same time, 20 threads are spawned, of which the first 4 open news server connections and start to fetch headers. The rest simply stay in the 'Waiting for a free connection' state. When one of the active threads completes, its connection is then reused by a waiting thread which can now start to fetch headers from the server. Having the ability to open multiple threads does not automatically mean that everything will become instantaneous; indeed, improper use of threads may make some operations slower, particularly if you are on a slow network connection. Selecting all your subscribed groups, and hitting 'Return' to open them all up is not a good idea. 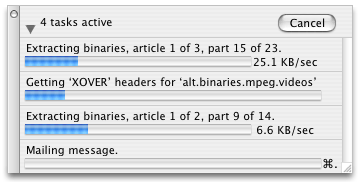 Things work most efficiently when you have one or two threads which are downloading data, while perhaps reading articles in an open subject window. More threads than this may impact on the responsiveness of the program and, if you are on a modem connection, won't speed things up any. The current threading implementation in MT-NewsWatcher makes no attempt to queue up user commands to be executed as the resources become available; threads are spawned when the user requests them. This may change in future implementations. Threading does incur some overhead, in terms of memory in particular, but these are far outweighed by the benefits of not spending hours staring at a rotating cursor while your newsreader gets article headers from the server. The memory overhead is not excessive (somewhere in the region of 24 Kb per thread). For a couple of functions, MT-NewsWatcher uses a background task which does a little bit of processing at a time when it detects that you are not doing other things. Such tasks are used to expire old articles in the Article Index, and old entries in the database that is used to store information about which articles you have read. Both these operations can cause some disk activity, so don't be alarmed if you hear some when MT-NewsWatcher is apparently sitting doing nothing.